Pipe Cleaning should first have a camera inspection to determine the location and nature of the clog. With that information you can then use manual brush cleaning with abrasive materials, electro-mechanical cleaning, or high-pressure hydro-jetting to clear the obstruction of debris or roots. Hydro-jet cleaning is a method of cleaning pipes with high pressure streams of water to remove build up and debris in tanks and lines. Water blasters are essentially pressure washers with extreme pressure from 7,000 PSI to 60,000 PSI. These units are classified generally as delivering ultra-high pressure. This range of pressures are designed for unique applications like pipe cleaning and water jetting. Power jetter drain cleaners are an outgrowth of the pressure washer industry. Early jetters were simply conventional pressure washers fitted with special hoses and nozzles capable of negotiating bends and elbows found in typical sink, shower and tub installations. Typically, the nozzles consisted of a ball-shaped or tapered body machined with orifices pointing both forward and angled rearward. These are known as penetrating nozzles. They rely on pressure alone to dislodge and break up blockages in drain lines as well as to propel the nozzle down the drain line. 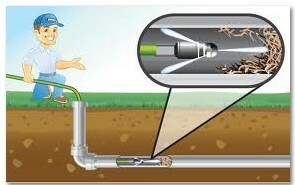 Electro-Mechanical drain cleaning involves using a sewer snake that will snag the clog or push it through to a larger pipe where it can flow to the sewer. Electro-mechanical cable drain cleaners have been around for many years and remain virtually the same today as they were in the beginning. Most of the advancements over the years have been in the form of improved cable quality, a wider variety of auger heads and the addition of power feed capability. These are the machines that utilize a spring type cable coiled in a cage style reel powered by an electric motor. The cable is fitted with a single or double bladed cutter, saw tooth cutter,grease spring or other cleaning head. They are available with different horsepower drives for different diameter cables and have a reach of up to 300 feet.